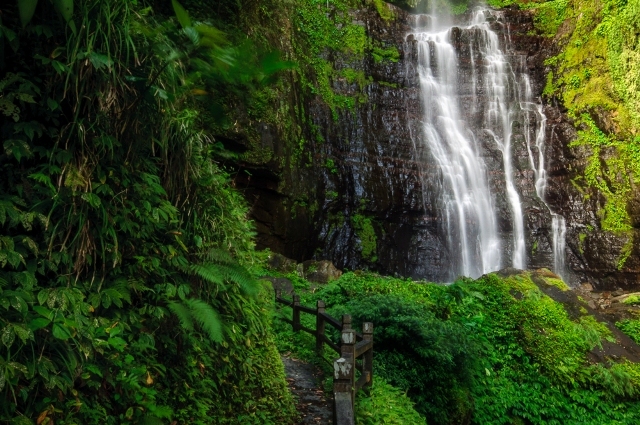 The Wufengqi Falls is one of the eight amazing scenic spots of the Lanyang Plains that is found at the Jioasi Township of the Yilan County. Behind the falls are five sharp peaks that look live five banners usually seen hanging down the back of the costumes of war generals in Chinese opera, hence the name that translates to “five peaks”. Mist and fog usually envelop that mountain top all year round with torrents of the mountain spring continuously flowing down the slopes. Such slopes and cliffs then give the Wufengqi Falls its three cascading layers that measure 100 meters in total. The falls are situated in an enclosed valley that only add to the enchantment and beauty of the peaks. At dawn, as the sky slowly begins to brighten, musical birdsongs can be heard resonating through the valley, which provides a unique tranquility in the majestic atmosphere. Entrance to the scenic view point is found at the bottom layer of the falls where visitors can make use of barbecue areas to have lunch picnics. Children will most especially enjoy the play area as they splash into the pools of the refreshing waterfall. When visitors get to the middle layer of the falls, visitors can enjoy a viewing pavilion where they can take their pictures with a beautiful backdrop of the falls. The pavilion also serves as a vast expansion of vision as they may see lush mountains and vast greenery from a distance. The first two waterfalls can be reached by walking up the trail for a few minutes but the highest waterfall can only be reached after a strenuous hike. Unfortunately, the uppermost falls were closed during the summer of 2009 due to a landslide during a typhoon. Either way, visitors can still appreciate the beauty of the cascading falls from afar. The amount of water that cascades down the falls varies depending on the season. During summer months, water from the falls can be somewhat minor but the spring, autumn and winter season proves to have enormous quantities of water that explode down the falls. But despite having a weak plunge, Wufengqi Falls is still very popular during summer weekends as a steady stream of cars and tour buses flock to the area. Surprisingly, despite the massive threat of the crowds, the falls and its surrounding facilities remain a beauty that is well worth a visit. Now the falls is not just there to be admired upon but to be enjoyed as well. Make sure to bring your swimming gear to experience the pleasantly cool water. Just follow the river downstream that is but minutes away from the falls where a large swimming area is open for the delight of visitors. This relatively small reservoir temporarily holds river water to create a pleasant swimming pool. Although it may be crowded during the weekends, the cold fresh water is certainly a good alternative to a hot sandy beach. The Wufengqi Falls is known to be the most impressive waterfalls in the Yilan County so make sure to stop by for a quick dip.